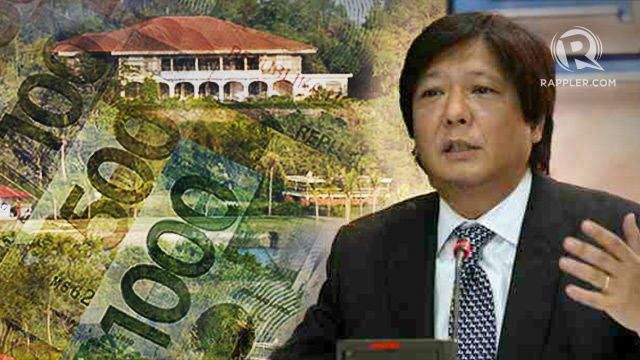 How much is Senator Bongbong Marcos worth? MANILA, Philippines – Mirroring his father’s time when the country’s economy was sinking while the family’s wealth was shooting over the roof, Senator Ferdinand “Bongbong” Marcos Jr’s wealth continues to rise even as his family businesses are operating at a loss. By the time the Marcoses abruptly went into exile in 1986, the national treasury was bankrupt and the economy was in shambles. Yet while the late strongman was in power, they reportedly acquired between $5 billion to $10 billion in ill-gotten wealth stashed in secret bank deposits and hidden by relatives and cronies. With a declared net worth of only P600,000 in 1992 after securing a seat in the House of Representatives for the 2nd district of Ilocos Norte, the 57-year-old Marcos scion’s net worth has jumped to P197.47 million or P441.997 million, depending on the basis of the computation in his Statement of Assets, Liabilities and Net Worth. Whichever computation is used, he remains the third richest senator, following Senators Ralph Recto and Cynthia Villar. (The 2014 SALN is not yet available as the deadline for the submission is on April 30, 2015). But this distinction blurs the fact that as a business owner, Marcos gets a failing mark. One family business apparently folded up after incurring successive yearly losses. How much is Marcos really worth? Based on Civil Service Commission Resolution No. 1300174 issued in January 2013, the declarants should declare the value of their properties based on the tax declaration. But Marcos went beyond this basic requirement. In his SALN, Marcos makes a distinction between his net worth based on the tax declaration of real property versus the appraisal report of reputable appraisal firm, Cuervo Appraisers. The result was two SALN reports of his net worth. In a note in his 2013 SALN, Marcos said he has been reporting the value of his properties based on the Cuervo appraisal from 1997 to 2012 which could explain his high net worth. 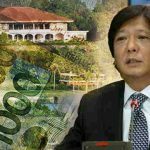 Regardless of the differing computations, the fact remains that at any given year, Marcos’ wealth is under-reported or under-declared, as the senator himself insists. He could be referring to the court cases involving sequestration of the family’s ill-gotten wealth and their effort to reach a compromise agreement with government. Apart from criminal cases resulting from the ill-gotten wealth, the Marcoses are also battling forfeiture of their alleged lawfully acquired assets. The Cabuyao property is a case in point. Five years ago, the Marcos family recovered ownership of a 25-hectare property in Cabuyao, Laguna after the Sandiganbayan ruled that the questioned property should be returned to the Marcoses. The property was sequestered by the government as alleged part of the Marcoses’ ill-gotten wealth. The 3 Marcos children however argued that the Cabuyao property was not part of the list of assets that the government had sought to recover from the Marcos family. The property was supposedly purchased in 1978 in the amount of P100,849.20. In January 2010, the anti-graft court, in a resolution, ruled in favor of the Marcoses. Based on the Cuervo appraisal, the Cabuyao property has fair market value of P622.574 million. From this property alone, Marcos stood to gain P207.524 million as part of his one-third share in the property. Another example is the 57-hectare Paoay property, which Marcos also sought to reclaim. The Sandiganbayan however junked Marcos’ petition last year. In any case, Marcos has officially declared so far 10 real properties, 7 of which are residential in nature. His personal properties consist of shares of stock worth P23.6 million; a collection of paintings worth P17.6 million; jewelry worth P15 million and a fleet of vehicles. While his SALN shows an ever-expanding wealth, disclosures about his business tell a starkly different story. In his previous SALNs, Marcos declared business interests in 3 companies which he and his wife Louise owned. These were the Augustus Management Inc, Beldevere Manpower Inc, and NIV Property Holding Inc. All 3 companies were put up in 2002. A fourth one, the law firm MOST (Marcos, Ochoa, Serapio, Tan), where his wife is a founding partner, was added in 2010. A check on the financial statements of the 3 companies showed these had been operating in the red. Beldevere’s available FS from 2003 to 2007 showed it operated on a net income loss. This company apparently had folded up. In his 2010 SALN, Beldevere was no longer on the list. Augustus Management, on the other hand, reported positive net income from 2005 to 2007. However, by 2011, it was already bleeding and in 2012, the company reported a net loss of P2.211 million. NIV Property, for its part, reported a net loss of P5 million in 2008; P4.9 million net loss in 2009, and P7 million net loss in 2010. There are no available financial statements from 2011 to 2014. In his latest SALN, the Marcoses had set up a new holding company , SASIVI Holding Inc. It has yet to submit its FS to the Securities and Exchange Commission.